May 3, 2015 Jogging through Toro Park on the Marks Canyon trail, Peter Kwiek encounters four men with picks, shovels, machetes, a gas can and what appeared to be a chainsaw. They were widening an animal trail for use as a mountain bike trail. 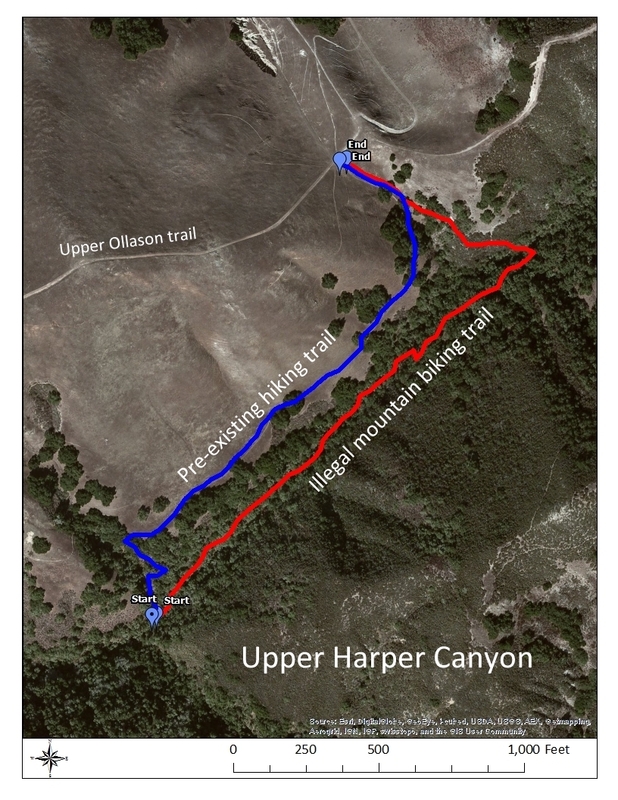 They said they also had completed a bike trail parallel to the Harper Canyon trail. May 14, 2015 The Monterey County Parks Commission decides that two representatives will visit Marks Canyon. Oct. 1, 2015 Kwiek provides Parks Commission with photos and maps of Marks Canyon trail in what had been a relatively pristine canyon and wildlife corridor. Commissioner Joe Hertlein asks if there is any way to stop the activity. Then-county Parks Director Mark Mariscal says “park staff has tried to go out to the site to enforce this action and anyone seen with tools is questioned.” Says he is unsure what code sections apply. Mariscal recommends that staff hold at least two community meetings “to discuss the expansion of bike riding within Toro Park” and report back by spring. Nov. 13, 2015 In letter to Mariscal, Kwiek says he had hiked into Marks Canyon to see how the rains were affecting the trail. Dec. 3, 2015 Parks commissioner Ada Winder says the county should explore annual bike passes and a solution to illegal entrance into the park. Jan. 2, 2016 Parks commission receives report on trail-building activities. Lower Black Mountain Trail: removal of native vegetation on erodible substrate, death of live oaks (and other things). Upper Black Mountain: chaparral being removed, a quarter mile of Manzanita and Canothus, though the trail is off limits to bikes. 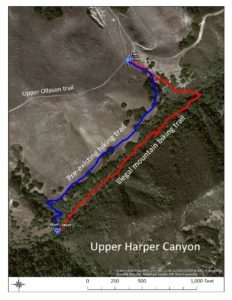 Harper Canyon-Ollason Saddle Redundant Trail: Removal of vegetation on steep slopes, sediment reaching into Harper Creek. Marks Canyon: A mile of unauthorized trail building, damage to native trees, 6-foot gouges, removal of boulders. Hiking only rule is not enforced. Jan. 7, 2016 Kwiek letter to county compliance officer: “I believe that the continued lack of official action or even public messaging on the part of the county is promulgating an understanding that the mountain biking community is free to do whatever it wants on public land without review or oversight, regardless of the damaging impacts. Article says Mariscal had tried closing the trails because of wet weather, had posted signs and might consider a sting operation if it has the resources. “(T)here has been unrestricted use on Toro Park trails,” says Mariscal. “The question is what to do about it.” Says he has launched a planning effort to develop sustainable trails for hikers, bikers and equestrians. Creates a 13-person committee representing stakeholders to hold public meetings. Committee is made up of two hikers, two runners, an adjacent property owner and eight mountain bikers. March 21, 2016 At the first committee meeting, bikers say they have devoted countless hours of volunteer work to creating, maintaining and improving trails for decades, with permission from park representatives..
Mariscal says county park volunteers do most of the trail work, most of which was blessed by former rangers. March 2016 Mariscal, park superintendent for 13 months, announces July retirement. April 2016 In response to a public records request by Edwin Norris, Parks Department says it has no records pertaining to trail-related work in the park between 2000 and 2016. April 29, 2016 Toro Park Trails Working Group status report says some trails not designated for bike use can be opened to bikes for special events. July 2016 Soberanes Fire breaks out near Big Sur and eventually spreads to tens of thousands of acres and burns for three months. Toro Park is closed to the public for use as a base camp for fire-fighting crews. Trail-planning work is put on hold indefinitely because of the fire and, later, by heavy winter rain. March 18, 2017 County announces through Herald article that the trail working group would start meeting again in April. August 2017 John Guertin, the county official overseeing the park system, leaves Monterey County for San Benito County. September 2017 Monterey County Supervisor Mary Adams says she will press the county to take control of the situation at Toro.